I love apples. 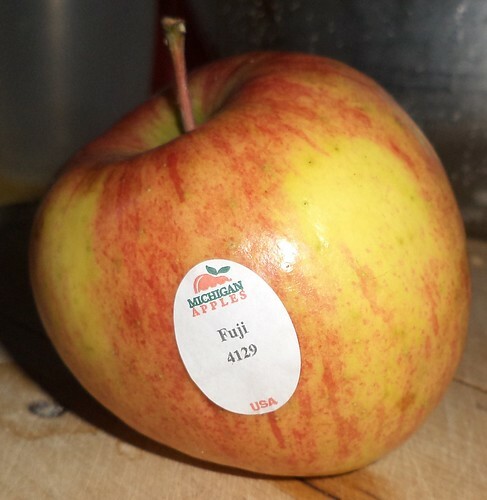 My favorite is Gala, but Fuji, shown here, and a Golden Delicious are good too. I haven't made a pie in years. I think about making homemade applesauce in the fall. With a good mix of apples, all you need is a dollop of cinnamon and no sugar. Drop it in a freezer container and then, come February, when all is frozen and there is the prospect of 10 inches of snow over the weekend, you can have warm applesauce instead of fake maple syrup on your pancakes. So why does this vex me? See that little tag? Oh lordy do I hate those. When I buy fruit, I just want to rip all the tags off, march over to the guy in the produce department and slap all of them on him. They seem to meld with the skin of pears, particularly if the pears are getting ripe. I tend to buy pears under ripe so they will not rot in the fruit drawer before I eat them. Apple stickers are sort of easy to remove, but I can't tell you how many times I have pulled an apple out of the bin and begun slicing it only to see a sliver of a sticker on the peel of one of the slices. It vexes me to no end to have to then try to pry the small sliver off the piece and find the rest of it. I realize that there isn't a better way to mark things like apples. You don't put them in plastic clamshell boxes like you do with berries and people want to pick their own apples off the pile. I can spend a good 10 minutes looking at the mountain of fruit and making my choices on which ones look best. And you can't expect your cashiers to be able to identify the 8 different varieties of apples you have, particularly when Gala and Fuji can look very similar but be much different in price. Still it vexes me. I sliced this apple for my lunch today. I happened also to find the caramel apple dipping sauce on a recent trip. Oh my. While I'll happily sit down and eat two apples, sliced, add a dash of caramel to the slices and it's heaven...(cue the music) I'm in heaven/and my heart beats so that I can hardly speak/and I seem to find the happiness I seek/when it's caramel apples that I have to eat. My apologies to Irving Berlin.